Foreign Language Anxiety (FLA) can be a crippling condition for many students, preventing them from taking an active part in the classroom, and also retarding their L2 use in wider communicative situations. Providing learners with the tools to overcome anxiety on an individual basis is an area which needs further investigation. Cognitive Behaviour Therapy (CBT) is a widespread counselling practice used to treat anxieties. It shares similarities with some techniques employed in Advising in Language Learning (ALL) for helping students with language goals, and it is worthwhile investigating and raising awareness of how it can be used for FLA. The article describes major characteristics of FLA and also CBT, and then describes four functions which CBT and ALL share: goal-setting, guided discovery, Socratic questioning and use of reflection. Preliminary research also demonstrates how some of the practices associated with CBT could be applied by Learning Advisors to help students to overcome FLA. This paper seeks to illustrate the potential of using CBT (Cognitive Behaviour Therapy) techniques in the field of ALL (Advising in Language Learning), for assisting students experiencing Foreign Language Anxiety (FLA). I will argue that although CBT is a form of therapeutic counselling provided by specially trained professionals, some of its methods could be adapted to help students deal with specific language anxiety related issues, as some preliminary research indicates. As ALL has been “significantly influenced” by counselling (Carson & Mynard, 2012, p. 6), LAs, with their advising skills, are in a privileged position to be able to offer assistance to learners experiencing FLA. The necessity for this type of help is especially pertinent in helping students with FLA on an individual basis outside the classroom. Currently, there appears to be little information available in the existing literature related to providing this kind of support for language learners; Tassinari and Ciekanski (2013) call for the need for a greater understanding of affective issues, which would include FLA. The potential role of CBT in advising has been noted by McLoughlin (2012) and Mynard and Carson (2012), and it is my aim to examine this potential in greater detail. ALL is aimed at “helping students to direct their own paths so as to become more effective and more autonomous language learners” (Carson & Mynard, p. 5), which will often involve addressing affective issues such as motivation and confidence. Therefore, advisors need to be able to deal with students’ emotive output, but they may find this difficult due to most LAs having a grounding in teaching rather than counselling (Tassinari & Ciekanski, 2013). However, as the discipline of ALL is influenced by counselling, and there are many shared techniques, it is possible that CBT methods can be adapted to use in cases of FLA, thus allowing LAs to feel more secure in dealing with issues involving negative emotions. Learning Advisors (LAs) at the Self-Access Learning Centre (SALC) at Kanda University of International Studies (KUIS) in Japan provide optional courses and advice for language students which is aimed at introducing the principles of self-directed learning, and also include strategies for dealing with anxiety and motivational issues; it is hoped that CBT methods can add to the existing tools at our disposal. Additionally, advisors, who are available on request for one-to-one advising sessions, arguably have more opportunities than classroom teachers to help in the long-term with FLA. It must also be noted that classroom teachers may themselves be a source of anxiety for the student, as will be explained below, so a ‘neutral’ third party may be more approachable. Before discussing some of the ways in which CBT counselling and advising overlap, supported by some preliminary research with three freshman students, it is necessary to give some explanation of the nature of the anxieties which typically afflict students, particularly freshmen, at KUIS. FLA can be defined as a fear of performing in a foreign language, and is undoubtedly a major impediment for learners, preventing full participation in and enjoyment of the language classroom. FLA is described by Horwitz, Horwitz & Cope (1986, p. 128) as a “distinct complex of self-perceptions, beliefs, feelings and behaviours” that a learner is forced to negotiate when in a communicative situation. It can be divided into three traits. The first is Communication Apprehension, or the worry that the speaker will not be able to express themselves coherently in the new language (Horwitz, 2000). Secondly is Fear of Negative Evaluation; the fear of being thought badly of by teachers and peers. The third trait is Test Anxiety. The first two are the most pertinent to this paper, as the fears described to me by students at KUIS during advising sessions tend to fall into these areas for various reasons that are discussed in the following paragraphs. Some learners at KUIS, including the three participating in my research, have come from a school background where they explain there was little or no communicative language practice, the focus being on studying written grammar constructs which will later be encountered in a test situation. As a result they are somewhat unused to speaking in English, and worry about whether their spoken grammar or pronunciation is good enough to be understood. Additionally, they often have classmates who have had much more speaking practice and are more confident as a result. Therefore, these anxious learners can feel inferior and self-conscious, concerned that they will appear foolish and be thought of in a negative way by teachers and peers. As such learners want to overcome these difficulties and gain the maximum benefits from their learning experiences, they require a means of overcoming their concerns and achieving some degree of control over communicative situations. This would require working towards gaining a confidence in their abilities which outweighs any negative self-perceptions or fears. This can be a challenging prospect for a young student in his or her first year of university, facing a completely new environment which is often very different to his or her school experiences. In this situation, as well as talking to friends or using personal counselling services, meeting an LA is a possible recourse. However, despite FLA being a frequent problem, and although there is much research into its causes (see for example Horwitz et al., 1986; MacIntyre & Gardner, 1989; Tsui, 1996), practical advice about how to help learners overcome it is less researched (Tsiplakides & Keramida, 2009). Researchers such as Young (1991) and Crookall and Oxford (1991) have presented ideas for managing anxiety in the classroom, but apart from the use of learner diaries, these tend to be group-oriented activities. Several students in the same class can have FLA, but they are also expressed on an individual basis and affect language use outside the classroom. 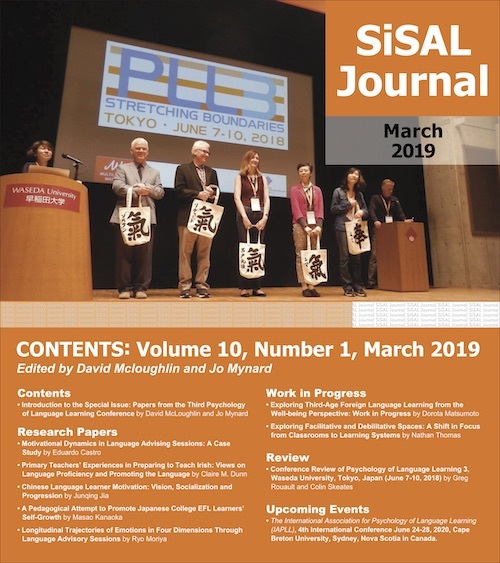 The development of tools and strategies to aid students with such problems will increase the powers of LAs to help students to address FLA, and preliminary research began in May 2013 in order to try out some ideas, which will be briefly described below. Which (if any) aspects of CBT can be applied for individual advising for FLA? Is it possible to design and utilise resources for LAs and students to practice these techniques? The project is ongoing and more conclusive results, especially concerning the second question, will be the subject of a future paper. But there is evidence to support the first question, which will be discussed in more detail below. Firstly it is necessary to give some details of the project itself. The research subjects are three freshman students, who for this research are assigned pseudonyms; Yamagata, Chiba and Kisarazu. All either directly or indirectly indicated to be suffering from FLA; they felt unable to participate in class discussions owing to a combination of a fear of negative evaluation and communication apprehension. I offered to help them and arranged weekly recorded meetings where we could discuss their difficulties. The initial meetings involved diagnosing their problems and establishing a rapport, while also discussing what a future ideal situation would be which they could work towards. Later meetings concentrated on setting short-term goals and reflection; the significance of these is described below. Simultaneously, I have been investigating possible techniques for offering assistance from the literature on CBT. The next section will describe how CBT works, its similarities with the techniques employed in ALL, and how it has been used with the students. 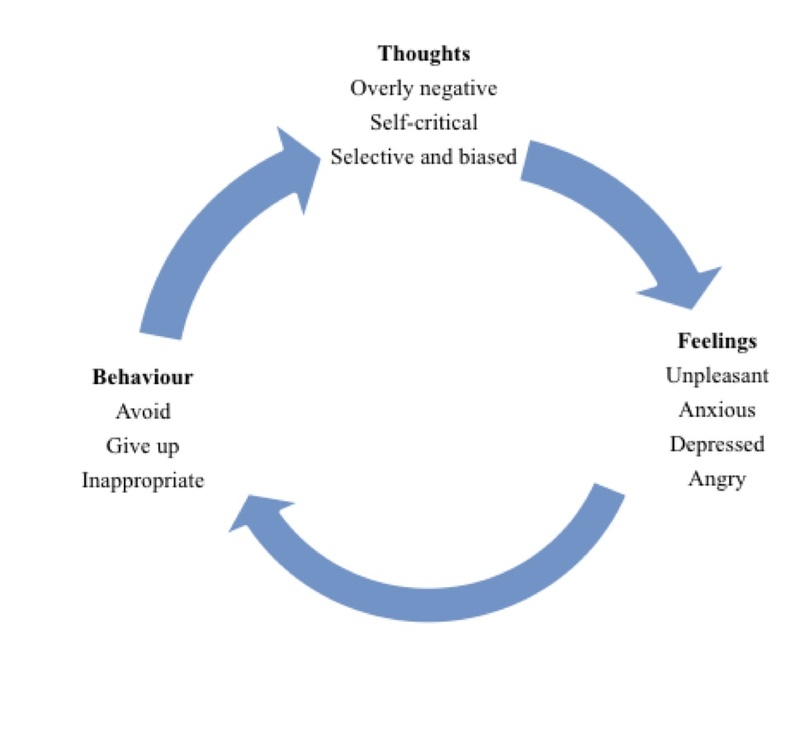 The premise of CBT is that sufferers become trapped in a cycle whereby their behaviour simply mirrors and reinforces their thoughts, which can become self-evident ‘facts’, and therefore are ‘true’. Such a case from an FLA perspective can be seen in the example of one of the participants involved in my research at KUIS, Kizarazu. In our first meeting she stated that she believed that her level of English was lower than the other students in class, and so felt nervous and shy. She was also worried about making mistakes, being concerned with the impression she would make on her classmates. As a result, she tended to keep silent, especially when working in groups. CBT seeks to introduce the notion that thinking negatively about a situation is merely one choice, and that more balanced and positive thoughts are possible. The client is encouraged to test their beliefs and find evidence which supports them, or to merely attempt to perceive a situation from an alternative, positive viewpoint. The therapy then is a very active process, with the client “encouraged to challenge and learn through a process of experimentation” (Stallard, 2002, p. 6). How this is conducted, and how it relates to some the principles of ALL, is outlined below. That goal-setting is a vital aspect of CBT, as a way of measuring progress towards solving problems, is made clear by Wilding (2012). She advocates the SMART (specific, measurable, attainable, realistic and timely) model, with a long-term target arrived at by a series of steps, the results of which are quantifiable and measurable, and which clients set themselves in consultation with their counsellor. The achievement of the goal and the resulting boost in confidence it can give, provides the impetus towards the next step. At KUIS, both in class (through the curriculum) and outside class (through voluntary course modules aimed at engendering autonomous learning skills, see Yamaguchi et al. (2012) for details), and in advising sessions, the students are presented with the concept of goal-setting. One role of the LA is helping students set these goals; guiding the learner towards the area he or she wants or needs to focus on, and helping them think about what can be realistically achieved in the time available. The goal-setting process undertaken by LAs will often involve encouraging students to think of a ‘big’ goal which involves improving one of the four main language skills, such as reading. They then decide a ‘small’ goal which can act as a step towards achieving the ‘big’ goal (for example increasing vocabulary), and can be arrived at sooner, for example within the semester. Therefore, as both LAs and students understand the importance and procedures of goal-setting, determining specific goals for FLA students should fit existing practice. In my preliminary research, I have worked with the students to set long-term goals to work towards, whilst also helping them find short-term targets aimed at gradually building up their confidence. For an example of how this might work in an advising scenario, I draw upon the case of one of my research participants Yamagata. Yamagata is afraid of being viewed negatively if she makes mistakes and is afraid of misunderstandings, but who wants to practice with L1 speakers. She decided that her long-term goal would be to go the ‘yellow sofas’ (a practice area where students can converse informally with teachers and other students, including international students) by herself. To achieve this, we planned a series of confidence-building steps; to make a point of asking her freshman English class teacher a question every lesson, to speak out in class discussions, to go to the yellow sofas with the support of friends, to try a language exchange with an overseas students, and finally go to the yellow sofas by herself. So far, she has been going to the yellow sofas in the company of classmates, and states that she feels she will be ready to go by herself in the coming first semester of her sophomore year. Both ALL and CBT aim to produce students / clients who ultimately are able to operate autonomously, discovering their own ideal way to make progress, without having to continuously rely on expert guidance. The goal of the CBT therapist is “to make herself redundant” (Westbrook et al., 2011, p. 121), which is done by training the client in how to establish and continue his or her own coping methods. According to Stallard (2002), the therapist acts as “an educator and facilitator, who provides a framework within which the young person can explore, understand and identify new ways of thinking” (p. 21). This is not at all dissimilar to the function of the LA, who serves to promote “the ability in learners to identify language needs and personalise the learning experience” (Carson & Mynard, p. 14). Japanese students’ experiences of learning at school, with its reliance on top-down instruction, can tend to leave them reliant on the need for prescribed methods, which do not account for idiosyncratic learning styles. Hence the LA attempts to encourage the learner to explore and experiment with new ideas, which will suit his or her own particular learning styles and preferences. This is most obvious through the use of Socratic questioning, allowing the clients / students to come to their own conclusions about either the reality of their beliefs or about which mode of studying suits them best. Its use will be explained below, supported by the example of a meeting with Yamagata when it was used. ALL employs the use of questions, designed to make learners query and think about their own ideas about studying as one of its basic tools. Often student requests for help with their study skills can cover very broad areas, for example “I want to improve my speaking”. Such improvement could cover items such as pronunciation, fluency, use of vocabulary or grammar, and even confidence-related issues. Sometimes a student will have a stated problem which in reality might actually have at its source a different issue. Therefore to realise exactly what aspect of language learning the student wants to work on, and what strategies and resources would best suit his or her own individual learning style, questioning is a vital ‘micro-skill’; “to elicit and to stimulate learner disclosure and self-definition” (Kelly, 1996, p. 96). To be an autonomous and effective language learner, the students needs to discover for themselves their own best ways of studying, rather than just simply be told what to do, and even if the LA does not necessarily agree with their decisions. Ideally, the students will learn their own strengths and weaknesses themselves, and this understanding can be used again when students find themselves in a similar situation. Similarly, CBT relies on Socratic questioning, in order for clients to seek alternative perspectives for their current understanding of a situation and arrive at a balanced view (Wilding, 2012). Clients are asked questions which are designed to elicit evidence for and against their belief, and also if there is any other way in which they can view a situation based upon that evidence. They can later use these same question types to prompt themselves, when they are no longer reliant on the therapist. Westbrook, Kennerley and Kirk (2011) provide the examples of “what contradicts my conclusions?” or “what would I advise someone else?” (p. 154). As in language advising, clients are not explicitly told that their thinking is incorrect; for them to solve their own problems, it is necessary that they arrive at their own conclusions. I have used Socratic questioning with participants involved in my research in order to help them reevaluate their thoughts. Unlike when advising for the purposes of studying, questioning of this type occurs when the student is reflecting on a negative experience or thought, and therefore will not necessarily occur with any frequency. Therefore the advisor must be aware of the need to be ready to utilise these chances to help the student think more positively. LA: Were you surprised that you found words you didn’t know? Y: I didn’t know many English words. LA: Why is that surprising for you? LA: Why would you think that’s surprising? Is English your first language? Y: Ah, soka (I see). LA: How long have you studied English? How many years? Five? Y: Yes junior high school. LA: What kind of language did you get at school? Easy language? High-level language? LA: Right. So would you be so shocked at finding lots of words you don’t know? LA: If you think about it, it’s probably normal. So you really shouldn’t feel so bad about it. Y: I’m too worried about. The questions gave Yamagata the opportunity to think about the situation differently. Rather than viewing her unfamiliarity with the vocabulary in this case as an example of her lack of proficiency, she was encouraged to see it as quite natural considering her learning experiences. The goal as an LA will be to motivate anxious students to ask themselves such questions, in order for them to gain confidence and ultimately achieve a degree of autonomy. Having students reflect on aspects of their learning is now very common practice in language teaching. In ALL, one role of the LA is to encourage learners to consider such matters as the effectiveness of strategies and resources they have tried, self-evaluating their own progress, and planning future studies in accordance with what they have learned. Reflection occurs in CBT as part of the process of clients gaining “new understandings of their problems” (Westbrook et al., 2011, p. 123), which subsequently influence future courses of action. This typically happens at the stage where the client is analysing critical events, for instance when examining evidence to determine whether it supports or negates their beliefs. The previous example of Yamagata shows such a case. 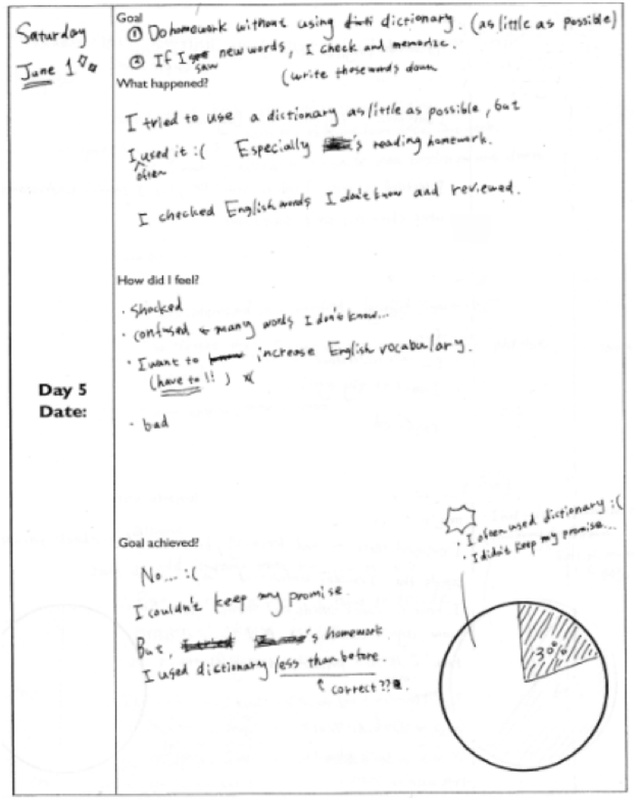 In order to help the reflection procedure a ‘daily goals’ handout was produced (see appendix), in which the students could record the goal they had set, the degree of success they acquired, and their feelings about what they did. The above conversation was prompted by Yamagata’s use of this handout. It provides a useful way to monitor progress towards the student’s goal, and serves as a talking point to address critical events. Preliminary feedback from the three students collected by a short questionnaire shows that they mostly find the process of setting goals and reflecting valuable, although it does entail spending time to do. Yamagata stated that the handout “was helpful for me because I found what I have to do clearly”, and she “could find change of my feeling and progress of speaking English”. Chiba could also “make sure my progress”, and in regards to reflection “telling my feeling is important to overcome my weakness”. It also allowed her to “look back what I did for my goal”. Lastly, Kisarazu found it motivating, and she began to feel that she could accomplish her target, and that “I was able to think about my concerns deeply”. In conclusion, there is real potential for using CBT in ALL to address language anxiety. LAs already use many of the same methods to achieve learning outcomes; the preliminary research described above shows how these methods can be used to target FLA. LAs with appropriate experience, and students to a lesser extent, will already be familiar with some of the principles such as questioning, goal-setting and reflection, and therefore training and implementation will not require a background in counselling. It would be a great help to those LAs, as mentioned by Tassinari and Ciekanski (2013) above, who may not feel so at ease dealing with affective-related issues as opposed to language learning issues. Research is continuing at KUIS to trial the methods and ideas described above, and more handouts to help students address and reflect on their anxieties are being produced, utilising Stallard’s (2002) worksheets for young people. It is hoped that they can become part of the tools available to make students’ learning experiences as positive as possible. It is also hoped that collaboration can be engendered with other institutions and the ideas presented in this article can be used on a wider basis. Neil Curry has been teaching in Japan for 8 years and is currently a learning advisor at Kanda University of International Studies. His primary interests are in FLA and language advising. Carson, L., & Mynard, J. (2012). Introduction. In J. Mynard & L. Carson (Eds. ), Advising in language learning: Dialogue, tools and context (pp. 3-25). Harlow, UK. Pearson. Crookall, D., & Oxford, R. L. (1991). Dealing with anxiety: Some practical activities for language learners and teacher trainees. In E. K. Horwitz & D. J. Young (Eds. ), Language anxiety: From theory and research to classroom implications (pp. 141 -150). Upper Saddle River, NJ: Prentice Hall. Kelly, R. (1996). Language counseling for learner autonomy: The skilled helper in self-access language learning. In R. Pemberton, E. S. L. Li, W. W. F. Or, & H. D. Pierson (Eds. ), Taking control: Autonomy in language learning (pp. 93-113). Hong Kong: Hong Kong University Press. McLoughlin, D. (2012). Attribution theory as an advising tool. In J. Mynard & L. Carson (Eds. ), Advising in language learning: Dialogue, tools and context (pp.151-163). Harlow, UK: Pearson. Stallard, P. (2002). Think good – feel good: A behaviour therapy workbook for children and young people. Chichester, UK: Wiley. Tsiplakides, I., & Keramida, A. (2009). Helping students overcome foreign language speaking anxiety in the English classroom: Theoretical issues and practical recommendations. International Education Studies 2(4), 39-44. Tsui, A. B. M. (1996). Reticence and anxiety in second language learning. In K. M. Bailey & D. Nunan (Eds. ), Voices in the language classroom (pp. 145-167). Cambridge, UK: Cambridge University Press. Westbrook, D., Kennerley, H., & Kirk, J. (2011). An introduction to cognitive behaviour therapy: Skills and applications (2nd ed.). London, UK: Sage. Wilding, C. (2012). Cognitive behavioural therapy (3rd ed.). London, UK: Hodder Education. Yamaguchi, A., Hasegawa, Y., Kato, S., Lammons, E., McCarthy, T., Morrison, B. R., Mynard, J., Navarro, D., Takahashi, K., & Thornton, K. (2012). Creative tools that facilitate the advising process. In C. Ludwig & J. Mynard (Eds. ), Autonomy in language learning: Advising in action (pp. 115-136). Canterbury, UK: IATEFL.